As a blogger, I spend a lot of time on my computer and my phone. It’s part of the job. I have noticed that my posture isn’t as great as it used to be. I am not quite hunchback, but I need to be careful. I use my laptop a lot, so I am usually sitting on my bed slumped over my laptop trying to work. It’s not good for my back or neck. I don’t like sitting in a computer chair for a long period of time. I wish I would have though. My neck has been hurting from looking down all the time. I had been looking for solutions to this problem online. I came across a company called Posture Pump®. They have products that will help your neck and back. As I was reading the site, I noticed that they mentioned headaches, and I have been having headaches. We have had so much rain lately, I thought that it was weather related but it might be due to my stooped posture. I was so excited to try out the Posture Pump®, I couldn’t wait for it to arrive. I thought it sounded so cool. I told my mom about it, she asked me how it worked. I told her that it has a pump similar to a blood pressure pump. She asked me to try it out when I see her again. I think she will like it too. She’s a teacher and she has to lean over to help teach her students. 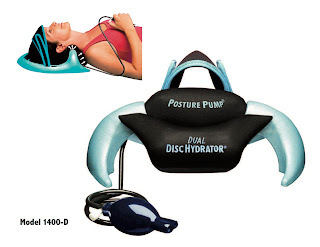 I love their slogan, "Dump the hump with Posture Pump®." When I received the Posture Pump®, naturally Noah was intrigued. He wanted to know what I was doing, and if it hurt. I told him it was something for my neck and spine, and he asked if he could try it out. I said, Sorry buddy. I really like how easy it is to use. When I read the instructions, it talked about a warm up. For a moment, I thought that I would have to exercise first, until I read further. It’s simple “exercises” where you move your head and neck. After deflating the pumped part, I was ready to start using the Posture Pump® Dual Disc Hydrator®. Pushing the deflate button and helping the air escape was oddly satisfying. I laid down on the floor and put the device on my head and under my neck and started to pump. I made sure Noah had the cats put away because you aren’t supposed to move while it’s inflated. I didn’t want someone to decide to walk on me while I was testing it out. It felt good to have the pressure on my neck. I am starting slow and making sure I don’t pump it up too much. I am also only using it for a few minutes each session per the instructions. I don’t want to overdo it. I have been doing it in the morning before Noah goes to school. It’s very important to follow the directions. I love that there’s illustrations too. I like to see what I am supposed to do beforehand. I plan to use the Posture Pump® as part of my routine. You can save 15% by using the code Sheila15 at checkout. This post was sponsored by Posture Pump®, all thoughts and opinions are my own.